Tuesday night’s loss to the Minnesota Wild might be the last game that Vancouver Canucks forward Rick Rypien plays for a while. I doubt even the NHL’s “Wheel of Justice” can save the Coleman, Alberta, native after he lunged at an opposing fan as he was being shown off the ice in the second period of what ended up being a 6-2 defeat. The whole thing started with a scrum in front of the Wild bench – Rypien and Minnesota’s Brad Staubitz were mixing it up after fighting earlier in the game. With a linesman between the two of them, Rypien threw a late punch and then seemed to blow a gasket as a different linesman tried to wrestle him over to his own bench. That alone might have warranted some type of fine/suspension, because I’m quite sure the league doesn’t take too kindly to players grabbing linesmen by the shirt collar as if they’re about to pop them. It didn’t stop there though - Rypien then took it to the next level, making coach Alain Vigneault’s 600th career game a memorable one. As he was making his way to the dressing room, he’s seen lunging at a Wild fan who is standing up and clapping behind the Canucks bench. Uh oh! TSN reports that Vigneault was keeping quiet on the issue in post-game interviews, saying that he couldn’t comment because he hadn’t yet seen a replay. By now I’m sure he has seen that video clip – but what do you really say about something like that? Yahoo's Puck Daddy, Greg Wyshynski, predicts a “sizable suspension” as long as we don’t find out that the fan did something outrageous to set Rypien off. My initial reaction to the video though is that the fan didn’t go over the top. Rypien looked like a ticking time bomb as he left the ice, with his coach seen trying to calm him down just seconds before this incident. Watch the video again – the only boundary being crossed is Rypien lunging from the players area to the part of the rink reserved for paying customers. As for crossing the line and becoming physical with a player – it’s clear as day that Rypien instigates the physical part of the altercation. Here’s another thing – having played hockey for most of my life, I strongly doubt that anything the fan might have said would be worse than what Rypien and his NHL colleagues dish out on a nightly basis. The Vancouver Sun says the league should throw the book at him! Iain MacIntyre says Rypien is a good kid, but there is nothing to justify his actions – adding that fans should never be the outlet for a player’s anger. ESPN's Pierre LeBrun says Rypien will likely “feel the wrath” of the NHL’s justice system as commissioner Gary Bettman “does not tolerate” altercations between players or personnel and fans. If you ask me, there’s no excuse for trying to beat up a kid in the stands even if he gets in your face (which doesn’t seem to have been the case). If it takes a big “statement” suspension to remind players not to do what Rypien did, so be it. On the other hand, he’s just a guy who had a mad minute – locking him up and throwing away the key doesn’t really seem like a great idea either. After all, players got away with much worse back in the old days. To be honest, I’m a little more shocked at the way he interacted with the linesman – players should not be latched onto an official like that, no matter how mad they are. What do you think? 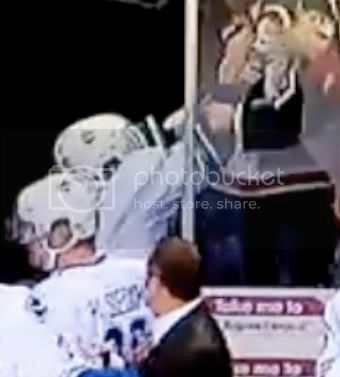 Should the NHL throw the book at Rypien, or should he sit for a few games and call it even? UPDATE: The league has suspended Rypien indefinitely pending a hearing. Kerrzy’s Notebook: Where Normal Happens? Kerrzy's Notebook: Hurt or Not? Kerrzy’s Notebook: Turkey on the Brain?